Cloud telecoms services (VoIP), contact centre management and CRM integration. Fail to prepare, then prepare to fail. 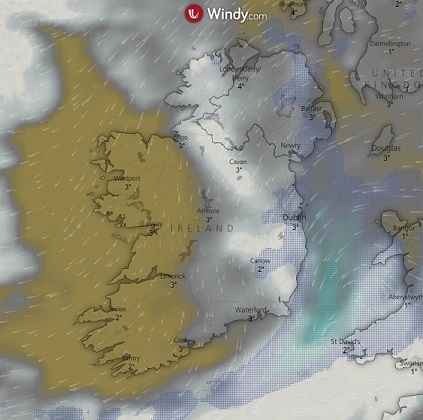 With the ‘Beast From The East’ about about to collide with ‘Storm Emma’ and deliver snow to Ireland, many businesses are facing the possibility that they may need to close their premises and have staff stay at home. However, just because your office is closed does not mean that your business has to close. One of the big benefits of our telecoms services is that they are all cloud based so your business VoIP system can be accessed remotely. So our customers can stay operational throughout the snow and have their staff answer their office phones from home. This is the easiest and simplest way to receive calls at home. Just take your deskphone home with you. Plug it into your broadband and you can receive calls as if you were in the office. The cloud-based nature of our services means you are not tied to a phone line in your office. Once you plug your phone in at home it automatically reconnects to our servers and delivers your calls via the number that is assigned to the phone. All your business VoIP numbers can be easily redirected to your mobile phone. Just give us a call on 015447888 and we can divert them for you. Or you can easily redirect them yourself, through your MyGoldfish Control Panel. Instructions on how to do this can by found in the ‘Diverting Calls’ section of our Help page here. If your company uses our Call Director / IVR service for your main business numbers, you can also easily also redirect those numbers to your mobile in the same way as above. A few months ago we launched Ireland’s first Cloud Phone called the Babelphone, so our customers can now make and receive calls through their web-browser without the need for handset or softphone. 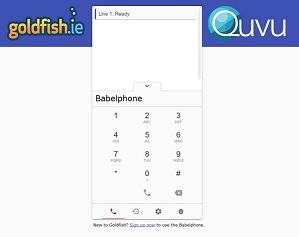 You can access the Babelphone here goldfish.ie/babelphone. Find out how to login remotely below. A softphone can be downloaded to your PC, mac or tablet so you can make and receive calls through a piece of software on your desktop. For Windows users your MyGoldfish Control Panel includes a free 3CX softphone, that comes preconfigured for each Direct Dial VoIP number. Just click the phone number you want to use in Your Numbers and scroll down to ‘Voice over IP settings’ see below. For Macs we recommend using TELEPHONE or the X-LITE softphones. Details on all softphones can be found in our Help Section. You can make and receive calls through all your numbers via an app on a smartphone or tablet. The app we recommend is the GS Wave, which is manufactured by GRANDSTREAM, the company that makes the VoIP handsets that we sell. Here are the links to download the GS Wave app from both the App Store and Google for Android. Each direct dial VoIP number has its own unique VoIP Username and VoIP Password. Therefore, all our customers need to do is login remotely to use our Cloud Phone, any of our softphones or the Grandstream Wave apps. 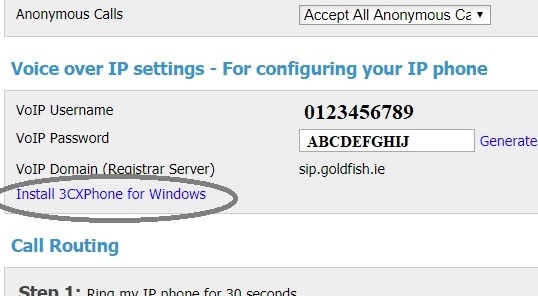 These details can be found in the ‘Voice over IP’ of the Your Numbers section on your MyGoldfish Control Panel (see the image in Softphone above). Goldfish’s Support Team will remain fully operational during any weather disruption. We provide full phone support for any help you need, so if you need assistance with any of the above then please get in touch. You can call us 015547888 or email support@goldfish.ie. The team operates between 9am and 5.30pm Monday to Friday. Good luck and see you on the other side. Click here for a fee phone bill comparison. What is VoIP? Please download our free infographic to see how VoIP works.